Someone should do this for the Family Circus. You know, for childless people. "Billy is asking for a glass of water just as Mommy was getting into bed after a 16-hour day", that kinda thing. Funny that you should say that, Parq. 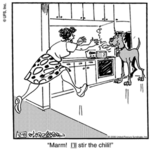 A guy did a Family Circus version and brought an onslaught of attacks from misguided Marmaduke Explained fans.